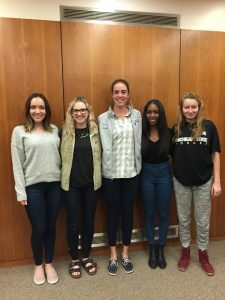 On April 27 the Women Association of Venture Capital and Private Equity (WAVE) student group was launched as part of the MSU Broad College’s Center for Venture Capital, Private Equity and Entrepreneurial Finance (CVCPEEF). WAVE is an excellence program for the advancement of women in venture capital, private equity, venture capital-backed entrepreneurship and asset management. This name is symbolic because we want to make waves to encourage more women to enter this field. Waves are bold, dynamic, full of energy, and so are the members of our group. We have a set of exciting initiatives aiming to develop leadership skills and to gain expertise in the best practices of venture capital, private equity, venture-capital backed entrepreneurship and asset management. Students in WAVE will receive mentoring from members of the CVCPEEF distinguished advisory board. Currently, WAVE has 14 members and is accepting applications. The faculty advisor of WAVE is Professor Zsuzsanna Fluck, Associate Professor of Finance and Director of the Center for Venture Capital, Private Equity and Entrepreneurial Finance. If you are interested, send your resume and a statement of interest to Professor Zsuzsanna Fluck.